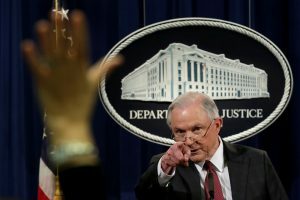 WASHINGTON — Attorney General Jeff Sessions is promising his Justice Department will lead the charge in helping cities fight violent crime, and police chiefs are ready with their wish-lists. But they have yet to detail how federal law enforcement should juggle priorities or offer new money for crime-fighting, especially in the face of Trump’s plan to slash nonmilitary budgets. Some clarity could come Thursday when the administration unveils its budget proposal. In Milwaukee, Police Chief Edward Flynn said he would like an expansion of the work done in that city by the Justice Department’s Violence Reduction Network. It teams officers with deputy U.S. marshals and agents with the Bureau of Alcohol, Tobacco, Firearms and Explosives and the Drug Enforcement Administration to target high-crime areas. “It’s encouraging to have an incoming administration take an interest in the spikes in violence in central cities,” he told The Associated Press. In Baltimore, which recorded 318 homicides last year, Police Commissioner Kevin Davis has said he would like federal agencies to double the number of agents assigned to cities experiencing spikes in violence. In Chicago, singled out by the White House for its surge in shootings, Police Superintendent Eddie Johnson has said he would welcome more agents and money for mentorship and after-school programs to help kids in violent neighborhoods and, in turn, reduce crime. More chiefs are asking the FBI for its help with intelligence-gathering to thwart crime, said Stephen Richardson, assistant director for the FBI’s criminal division. “Our budget’s been eroding,” Thomas Brandon, acting ATF director, told a congressional committee last week. The ranks of the agency’s special agents hit an eight-year low in fiscal year 2013 and have not grown dramatically since then. Sessions’ focus fits his background. His career as a prosecutor began when there was bipartisan agreement in Washington that the best way to fight crime was with long, mandatory prison sentences. And he views today’s relatively low crime rates as a sign that those policies worked. Just last week, he underscored his priority in a memo to the nation’s federal prosecutors that they should use all available resources to take down the worst offenders. In contrast, the Obama administration’s Justice Department focused its aid to local police on improving community relations. The federal government has long played a role in fighting crime through grants and partnerships. Agents assigned to field offices work with local police to share intelligence on gangs and shootings, hunt fugitives and probe bank robberies, among other things. Constance Hester-Davis, special agent in charge of the ATF’s field division in New Orleans, said her agents routinely work alongside local counterparts, even attending community meetings. Richardson, who formed the first FBI task force in Louisiana to combat violent criminals, said the new focus will mean shifting resources in ways that are yet to be seen. The FBI is finalizing a strategy to “surge” resources, including agents, in certain cities this summer.